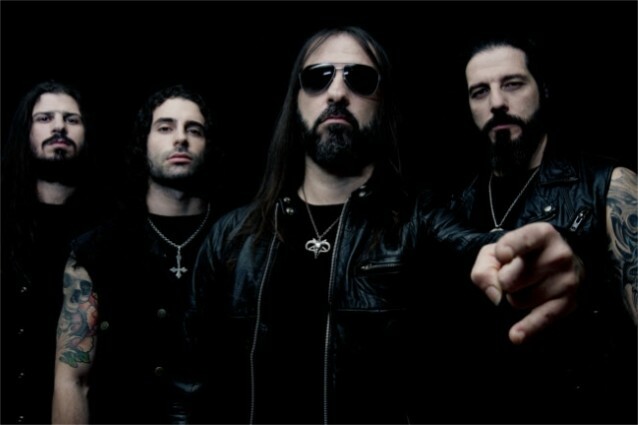 Yesterday the Russian site Satanath (home to Satanath Records) premiered another new song off the new album (The Heretics) by Rotting Christ, which will be released by Season of Mist on February 15th. The name of the song, “Vetry zlye (Ветры злые)“, explains the choice of Satanath for the premiere. But although the song title and some of the lyrics are in Russian, it’s not Sakis Tolis who “fights his way through a maze of Russian phonetics” in the chorus, but guest singer Irina Zybina (vocalist in the Russian folk metal band Грай [Grai]). “The song is rhythmic and its vibes bring the breeze, cold as a grave; its odor is full of monolithic perseverance and centuries-long solidity. No clumsiness or redundant experiments, everything is so traditional, march-like tempos make this song a classic Rotting Christ hymn. Russian-versed chorus is not the only feature of the single, tremendous male choirs are included and make the song so dense with atmosphere, that you feel like in the very heart of a fog-covered domain, unable to hide. Epic composing, deep folkish vibes and natural darkness are the three pillars that hold the «Vetry Zlye» temple”. 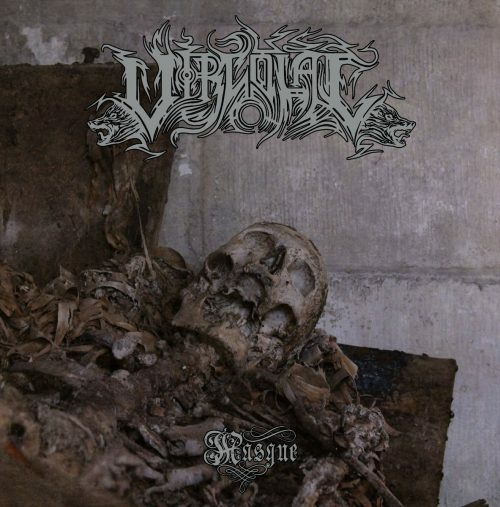 The Irish death metal band Vircolac (named with the Romanian word for werewolf) made a vivid impression with their 2016 debut EP, The Cursed Travails of the Demeter, and at last they’ll be releasing a debut album through Dark Descent (in the U.S.) and Sepulchral Voice (in Europe). The album’s title is Masque, and today the first advance track was made available. The press announcement explains: “Thematically, the album reflects two different strands of storytelling, with Side-A adopting a starkly defiant tone throughout. Side-B then takes a moodier assessment of the obsequious venality that governs the world we inhabit and inherit. The conclusion of this being the mass industrialized slaughter of much of Europe’s young in the great war”. The first “single”, “The Long Trail“, comes from that second side. It vividly portrays some of the talents I remember from the band’s EP, and more. The music is well-integrated (and constantly changing) display of death and black metal, one that thunders and ravages in extravagant (and supremely vicious) fashion, both brutally cold and savagely inflamed. In its slower moments, it’s also shuddering in its bleakness, and affecting in its accents of sorrow. I paid attention to this next song, the first demo track by a new band called Crossbow Suicide, because of the recording line-up: Håkan Stuvemark (guitars and bass), Jon Skäre (drums), and Jonny Pettersson (vocals). Stuvemark and Pettersson are of course bandmates in Wombbath and Skineater, while Skäre is also a proven commodity in other bands (including accompanying Stuvemark in another one of his projects that we’ve covered here, Rex Demonus). And so I was curious to hear what they’re doing in this new project. “Swedish D-beat, grind, angry, old school death metal” is the band’s quick summing-up, and it’s a decent preview of this new track, “Slingshot Sniper“, which debuted a couple days ago through a video that lifts some (perhaps unintentionally hilarious) footage from B-grade film fare. The music is a savage, body-mangling, highly mosh-worthy romp, mixing plundering grooves, lead-weighted riffs, fiery, high-flying soloing, and a high-low vocal tandem that’s authentically out of control. Bakushin are a new Seattle-based band who’ll be playing their first show tomorrow night (I plan to be there), and to pave the way for that, they’ve just released their first single off a forthcoming demo. I try to keep politics mostly out of my writing, because no one comes here to read that kind of thing, but I confess that with each passing day I’m more inclined to believe that we do need to “Excrete the Rich“, which is the name of the song, and is a process that of course first requires that we consume them (or at least, as this thought-provoking NY Times opinion piece argues, pry enough lucre away from them that they can no longer exert so much unjustifiable and usually self-centered power over the lives of everyone else). Okay, enough of that. And lest you be mis-led by that NY Times link, this isn’t high-brow, intellectually stimulating music you’re about to hear. It’s rough, raw, crusty death-punk, and what it lacks in chrome-like polishing it makes up for in brawling energy and red-throated conviction. It makes for a good, roiling and rough-housing, follow-up to that Crossbow Suicide track, and it’s damned easy to yell out the lyrics right along with the vocalist. Nepotism Alert: That vocalist, by the way, J. Schafer, is an old friend, a former writer for this site, and a co-conspirator of mine in the production of Northwest Terror Fest. I succumbed to DGR’s entreaties in including this final piece of music. He’s really the one who should be writing the introduction, since he’s much more familiar with the musical output of Sebastien Pierre, and has written extensively about the music of the bands in which he participates — Fractal Gates, Enshine, and Cold Insight. Unlike me, DGR is also a video gamer, and undoubtedly would have even more to say about this next track because it’s a heavy metal interpretation by Pierre (under the guise of “Sebdoom“) of music from the Mass Effect games. 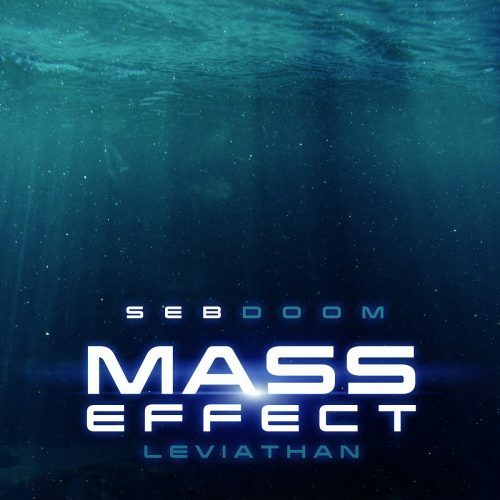 Before listening to this track (“Leviathan“), I knew absolutely zero about Mass Effect. Now I know quite a bit more, thanks to the distorted, deep-voiced narration (with sub-titles) that accompanies the music — which I find to be a fascinating tale (DGR says it’s “spoiler-heavy”, for those of you who haven’t played the games and might want to). I find the music to be fascinating as well, and it well-suits the galaxy-spanning tale supremely well. The video is also a feast for the eyes. In addition to the video you’ll find below, Sebastien has released this track as a single, with a B-side consisting of just the instrumental music, without the narration. I’ve included a stream of that below, too. This, by the way, isn’t the first time Sebastien Pierre has composed his own take on the Mass Effect series of games — he’s been doing this for many years. You can find more through the Bandcamp link. That was a cool video. I am no gamer but it definitely appeals to the hard sci-fi fan in me. The music suits it perfectly. Thanks for the tip.